South Africans have only 6 days left to nominate exceptional youth between the ages of 14 to 35 years and public, private and civil society organisations that make tangible contributions to youth development for the 2nd Annual South African Youth Awards. The nomination period will close on Tuesday, 30 April 2013. 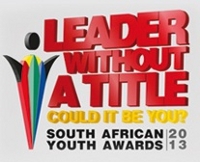 An initiative of the National Youth Development Agency (NYDA), categories include: Academia; Arts and Entertainment (includes music, film, literature and dance); Entrepreneurship; Extraordinary Champions (young people with disabilities); Health and Wellbeing; Science, Technology and Innovation; Social Cohesion/Civil Society; Environment; Public Sector and Private Sector. “We would like to thank those who have nominated thus far and urge others to follow suit as the clock is ticking,” says Steven Ngubeni, NYDA CEO. Ngubeni explains that the theme for this year’s awards is A Leader Without a Title, the aim is to recognise inspirational youth from rural, peri-urban and urban areas that are not necessarily in the limelight but have shown leadership in their communities and their chosen fields. The winner for each category will receive R50 000. The overall winner, chosen from the category winners, will receive the Presidential Award and R100 000 prize money. Nomination forms can be accessed via the South African Youth Awards website, NYDA branches across the country and LoveLife Centres. Nomination forms can be emailed to [email protected], faxed to 086 606 6563 or submitted at NYDA branches or LoveLife Centres by 30 April 2013. “This is an opportunity to sing the praises of unsung South African heroes and heroines so that they can be motivated to do more and inspire others to do the same,” Ngubeni concludes.